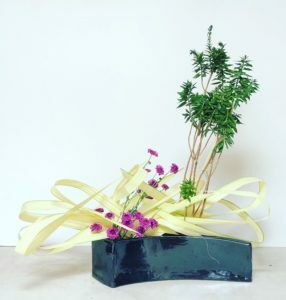 During this workshop, offered by international Ikebana artist Ping Wei, students will learn the art of Japanese flower arranging, where the process is as important as the resulting arrangement. In Ikebana, the learning does not come from merely memorizing the basics, but also from the process where students begin to attune to their inner selves, to the flowers and branches they are touching, to the surroundings that envelope them, and by extension to the world in which they exist. During this relaxing workshop students will feel their creativity blossom. Class will begin with Ping providing a verbal history of the art of Ikebana. He will discuss that the art form takes root in the concept of simplicity, and that there is an emphasis on lines and the use of space. After a demonstration by Ping, students will make their own, original Ikebana arrangement. The workshop will conclude with a thoughtful critique of each student’s arrangement. Participants are asked to bring their own small or medium-sized vase or vessel for their design. Ping Wei started his Sogetsu Ikebana study in 2003 under Yukiko Kimoto sensei in Phoenix. His current teacher’s ranking is first grade Somu. 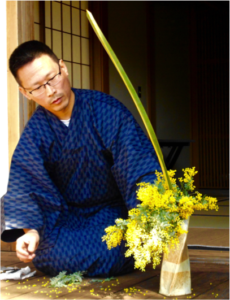 He travels to Japan to further his studies at Sogetsu headquarters in Tokyo, and also attends Sogetsu Ikebana master teacher’s workshops in the United States yearly.